James Fletcher was born at Dalkeith, East Lothian, Scotland, in 1834. As a boy he had worked in the Scottish coal mines. In 1852, at the age of eighteen, he headed for the Australian goldfields seeking his fortune. Gold had been discovered in NSW in 1851 and by 1852 the gold rush was well under way. 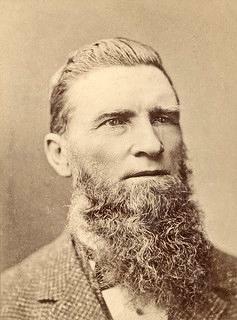 James Fletcher was one of 370,000 immigrants to Australia during that year when gold fever hit the Colony. Within two years he had abandoned the goldfields and moved to Newcastle taking up employment as a miner in the Burwood Tunnels. On arrival in Newcastle he lodged at the home of James Birrell, underground manager of the Australian Agricultural Company’s colliery. In 1854, he married James Birrell's daughter, Isabella.1That year he was employed as a pitman in Newcastle's Borehole Colliery, also owned by the A. A. Company. At a meeting of miners he 'stood on a box and advocated the formation of a union'. 2 He was just twenty years of age. The Borehole Miners' Lodge was formed from that meeting; it was the beginning of Trade Unionism for the coal industry in Newcastle. In 1874 he was voted first Mayor of Wallsend. In 1876, he became proprietor of the Newcastle Morning Herald and Miners' Advocate, now known as the Newcastle Herald. Under his management the newspaper averaged a readership of 8,000 per day in 1879.4 In 1880, he entered State politics as the Member for Newcastle. He was N.S.W. Minister for Mines in 1886 and Minister for Public Works in 1889. He remained a Member of Parliament until his death in 1891. James Fletcher died suddenly in Melbourne on 19th March 1891, at the age of fifty-seven. He was a Freemason; a member of Lodge Harmony in Newcastle, and Lodge St James No. 45 at Wallsend, where he had reached the degree of Past Master. He was buried with full Masonic honours and his funeral was the largest Newcastle had ever seen, over 25,000 mourners and spectators lined the streets of Plattsburgh and Wallsend. He was interred with his three children who had predeceased him, in Old Wallsend Cemetery which was known at the time as Wallsend Cemetery. It was located between Newcastle Road and Thomas Street, Wallsend, but was reclaimed as a public rest park in 1953. Today, James Fletcher's remains are still in their original resting place, and the headstone, along with many others was turned to rubble to be used for road base. In 1897 a monument was erected in Fletcher Park, Newcastle, in his honour. It represents James Fletcher standing ready to address a meeting. James Fletcher was known as the "miners' friend" and the "miners' advocate" because of his gift for arbitration and negotiation between managers and miners. 'Labour Leader', Newcastle Morning Herald, 5 September 1947. 'Story of James Fletcher, his is the only statue Newcastle has raised', Newcastle Sun, 6 July 1961. Print. 'The Late Mr James Fletcher M.P., Family Life', Newcastle Morning Herald, 21 March 1891. 'Story of James Fletcher, his is the only statue Newcastle has raised', Newcastle Sun, 6 July 1961, no pagination. J. G. Lowndes, 'James Fletcher, The Miner's Advocate', Newcastle History Monographs No. 10. 1982, p. 9. 'Memorial Funeral service at Platsburg', Newcastle Morning Herald, 24 March 1891, p. 7.